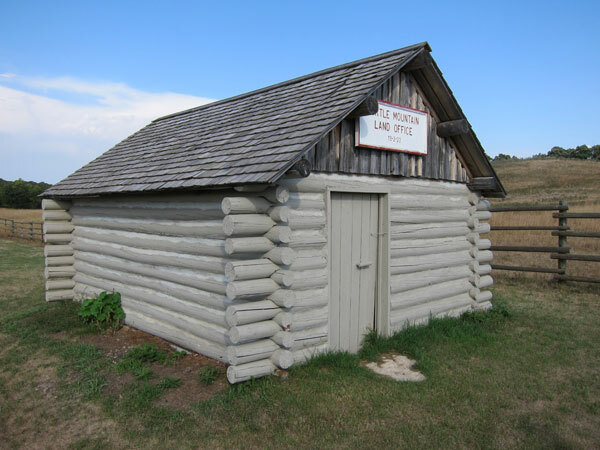 The first land titles office in the Turtle Mountain area, in what is now the Municipality of Deloraine-Winchester, was a solitary tent that was set up in August 1880 by land titles officer Mr. Cobb. By the fall of that year, and particularly as more and more pioneer-settlers began filtering further west, it became necessary to appoint someone to establish and occupy a permanent Land Titles Office at Turtle Mountain to allot and approve land claims in the area. The Canadian government decided to appoint its “most experienced officer,” which turned out to be George F. Newcomb, a timber inspector and land office clerk from Winnipeg. He was promised a salary of $1,200 a year. When his office was built, it became the administrative centre for over 2,700 square miles (about 6,900 square kms) of territory; a full 75 townships. Newcomb moved out to Section 19-2-22 in 1880 with his second wife and a daughter from his first marriage. When he arrived at the site of his land titles office, he found a number of settlers already impatiently waiting. He was quick to build the two-storey building that became his office and home, situated right beside the Boundary Commission Trail and on the bank of Turtlehead Creek (formerly known as Whitewater Creek). All newcomers to the area were required to make their way to Newcomb to fill out applications for land and pay the accompanying fees. Some days, as many as 70 people waited outside the office for their turn to do business with Newcomb. It was not uncommon for a man to arrive early in the morning one day and have to wait until late in the evening of the following day before he was seen to. Such was the need for a land titles office in the area. In the first year of its operation, the office granted 328 homesteads and 301 pre-emptions (promises to develop). In 1882, there was a boom in settlement and 1,641 homesteads and 1,404 pre-emptions were granted. Within six months of its opening, businesses and establishments had begun to crop up close to the land titles office, and the town of Old Deloraine was established a few miles away. The land titles office itself was used for church services and hosted the first agricultural exposition in the district in December 1881. In 1886, with the construction of the railroad, the land titles office moved to the New Deloraine townsite, several miles to the northwest. Newcomb’s Hollow, once the busiest site in southwestern Manitoba, fell into disuse. The office continued to operate out of New Deloraine until 1893. By this time, the office had fulfilled its mission and there was very little land in the area that remained available for distribution. During its thirteen years of operation, 1,200,000 acres of prairie land was settled (over 200 townships). The original site of the Land Titles Office was submerged in 1962 by the Deloraine reservoir. The ravine in which Newcomb’s Hollow is nestled remains as a reminder of George Newcomb and the important role that his office played in the settlement of Manitoba’s southwest. The 32-hectare site was purchased in 1993 by the Turtle Mountain Conservation District. A replica of the Old Deloraine Land Titles Office is nestled in this picturesque ravine. 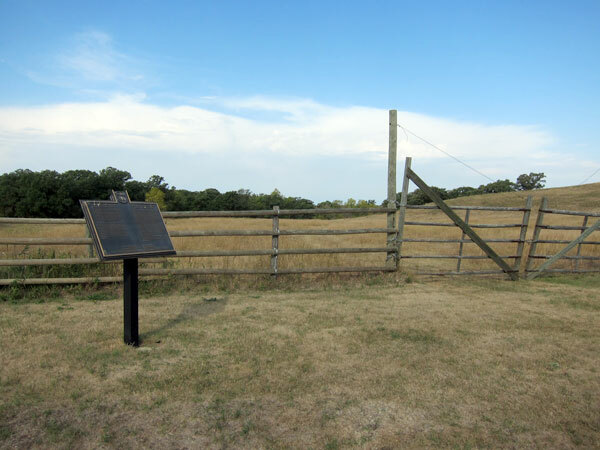 The historic Boundary Commission Trail, one of the longest intact portions in Manitoba, is also visible at this provincially-designated historic site, marked by a plaque unveiled in 1999 by the Manitoba Heritage Council. Boundary Commission Trail - Turtlehead Creek Crossing, SE 19-2-22W, 5 km southeast of Deloraine, Manitoba Historic Resources Branch. This page was prepared by Teyana Neufeld and Gordon Goldsborough.